I have often gotten confused when reading about burials in Racine because Mound was not the first cemetery in Racine — the City Cemetery was — and bodies were moved from both the City Cemetery and Evergreen Cemetery to Mound, not always in an orderly fashion. Below is an article written by Eugene Leach for a newspaper. If you’ve done much digging in Racine history, you’ve run into Mr. Leach, and you know he’s always thorough! There are few persons in Racine, or any other American community, who have reached the age of discretion, but are interested in the cemeteries; or in that particular cemetery where lie the mortal remains of one or more loved ones gone. The affection bestowed on them in life, finds expression, now that they are dead, in keeping green and bright the bit of earth where their forms were sorrowfully laid away and the living insist that all the surroundings of the burial place of their dead be kept in respectable harmony with the sentiment that actuates them. In this sketch is is proposed to present, not exhaustively, but in outline only, a view of the provision that Racine has made for the care of its dead, form the beginning of its history, and of some places with which it had nothing to do. If we begin at the beginning, mention must first be made of the Indian mounds, the presence of which within its limits furnished the name for our oldest, largest and most beautiful cememtery. These mounds are pre-historic burial grounds, and any authentic information concerning them is of such great interest to Racine people, that we think it worth while to quote a paragraph or two from an article on these very mounds by William Barry, in volume 3, page 188, Wisconsin historical collections, printed in 1857. Mr. Barry says: “At Racine there are a number of very interesting remains, chiefly on the high grounds near Root river, from one to two miles from the lake. Here are numerous circular burial mounds, though, of small size and elevation, embraced in one circular enclosure, with several tapering ridges. The mounds are without systematic arrangement, from five to 50 feet in diameter, and from one to seven feet in height. Dr. Hoy of Racine — (P. R. Hoy — E. W. L.) — opened one in which were found the skeletons of seven persons, in a sitting posture, facing the east, but unaccompanied with ornaments. In another, he discovered two vases of pottery, one made of cream-colored white sand, like pale brick, of the capacity of five quarts; the other which was of a red brick color, was smaller. Both are thought to resemble those in culinary use among the Burmese. The great antiquity of these remains is made clear by the gigantic size of the trees now standing upon them — one with three hundred rings showing, as Dr. Hoy estimates, an antiquity of a thousand years. But the most numerous group of these mounds lies about a mile west of Racine, and a part of them has been embraced in the modern cemetery of that beautiful city. When Mound cemetery was laid out in the first place, great pains were taken to preserve the Indian mounds — largely at the instigation of Dr. P. R. Hoy. They were preserved and later were provided with markers by the city council. There was a cemetery within the limits of the original plat of Racine before the city was founded. In an interview with Alex Hood a few years ago, I was informed by him that Stephen H. Safe, who came to Root river in February, 1838, told him when he arrived there was evidence of an Indian burial mound, on poles — then in disuse, of course, just north of Third street, between Main and when he came, a boy of 11, in 1838, and that he knew nothing about it. Mr. Hood said that it was not there Chatham (now Lake avenue) streets, except what Mr. Sage told him. The story is credible, for neither Mr. Hood nor Mr. Sage was given to fairy tales. No doubt some settlers died and were buried in Racine before any provision had been made for a public burial ground, though probably they were very few, for pioneers are rugged fold, and the hazards of life on the west shore of Lake Michigan from 1834 to 1842 were not such as would add in any degree to the normal death rate of such people . The first official action toward securing a cemetery was the appointment by the village board on April 21, 1842, of Alanson Filer and Sidney A. Sage as committee to report a site for such ground. On Aug. 5, 1842 the report of the committee, recommending the selection of block 38, school section, was adopted. This block comprised the land between Thirteenth and Fourteenth streets, from College avenue to Villa street, or two city blocks as they are now laid out. The Winslow school is on this land. Survey Moses Vilas was directed to make a plat of the new cemetery, making the lots 16 feet by 20 feet and David Smoke was engaged to clear the land. A fence was built around, and it was in use until 1852, when Mound cemetery was established as the official city burial ground. The first sexton was Richard Jones, who in common with other early sextons, received no regular compensation, but was allowed to charge $1.50 each for digging and filling grave. The rate for that work has increased measurably since those days. On March 1, 1848, at one of the first meetings of the common council after Racine became a city, a resolution was adopted establishing block 48, school section, as a common cemetery. I think it was never so used, though the resolution was not rescinded by the council. That block was between Fifteenth and Sixteenth streets, and College avenue and Wisconsin street, which was about a mile out of town at that time. On Dec. 31, 1851, the city council adopted a resolution authorizing the mayor to deed to the trustees of the Female seminary, the north half of the old cemetery property, provided that $8,000 for the erection of buildings thereon be raised. There were other conditions which altogether appear to have made the offer unacceptable. The new cemetery on Barnstable street (College avenue) had been in use but a few year when it was realized that it was a badly located, and that one of the first duties of the new city government, organized in 1848, was to select a new site for a city burial ground. Committees were appointed and much talk indulged in, but it was not until 1851 that the Mound cemetery site was determined on. Naturally this was not satisfactory to everybody, and while the work of locating and establishing Mound cemetery was proceeding, a company was organized to establish a private cemetery. This was called the Evergreen cemetery, and it secured a beautiful tract of land of 25 acres, on the lake shore just south of Racine college. The land was purchased from Lorenzo Janes, by Isaac Taylor, John W. Cary and others, on March 18, 1851, for $2500, by whom it was transferred the same day to the Evergreen cemetery for a consideration of $1. A tract from the north half of this land about 900 feet long east and west, with 450 feet frontage, and a width of about 650 feet on the west end, was platted at once into nine irregularly shaped blocks, divided by gracefully curved driveways, containing 1291 lots. The company was incorporated March 3, 1869, and given legislative authority to vacate any street, alley or lot, and to sell all or parts of land owned by it. It had already sold, on Nov. 15, 1853, nine acres to John W. Cary, for $450, and on May 16, deeded the south two-thirds of the land it then owned to Daniel Bull, in consideration of his agreement to put in lake shore protection over all, and to dis-inter from the south two-thirds, all bodies found there, and re-inter them in the north one-third. At the time the Evergreen cemetery company was organized, in 1851, Main street ran east of their land, and there were 100 to 200 feet of land east of Main street. The continuation of Main street was the highway to Kenosha. In 1871 the encroachment of the lake on the bank at this point had extended so far as to make it unsafe for vehicles to travel on it, and on Nov. 18 of that year the company deeded to Mt. Pleasant enough land on the west line of their property for a highway around it. When this highway was completed, travel on the Main street front of the cemetery was discontinued. Since 1871, more than 600 feet of the land of the cemetery has been washed into the lake, an average of 12 feet per year. For the last year or two there has been no encroachment, and it is hoped that steps may be taken shortly to prevent further waste of the valuable land in that vicinity. Remarks – By member of committee. Reading of Scriptures – Rev. Mr. McNeil. Prayer – Rev. Timothy Hopkins. Singing – Prepared for the occasion. Address – Rev. Mr. Rollinson. Dedicatory prayer – Rev. Mr. Humphrey. Singing – The Orphan’s Prayer. Benediction – Rev. Mr. McNeil. Isaac Taylor was president of the Cemetery company, and associated with him were Nelson Pendleton, S. C. Tuckerman, Roswell Park, A. G. Hartshorn, Daniel Ullman, and numerous other men prominent in business and social circles in the city. The rules of Evergreen cemetery, of which there were seven, were evidently compiled with much care, and with the idea of placing the control in the hands of the trustees, as was eminently proper. Use of lots for any purpose than burials; selling of grave room by lot owners; disinterment, or cutting down trees without permission was prohibited; right to erect proper monuments, and to build walls around lots, under restrictions, was allowed. The trustees had the right to cut down harmful trees, etc., and to remove monuments, effigies, structures or inscriptions considered by them offensive. In its heyday the cemetery was a delightful spot. Rows of stately and beautiful evergreen trees practically surrounded it, and many were scattered throughout its grounds, which, with the flowering shrubbery set out along the drives, made it peculiarly attractive. I visited the location this week. To say that not a vestige of it remains, while not absolutely accurate, is so near the truth that it does no violence to the fact. It was once a beautiful place for the dead; it is now a dead place – neglected, unbeautiful, desolute. There are three slotted bases for slab grave stones, scattered among the wild, ragged shrubbery; those, and a few deep depressions, here and there that speak graphically of violated graves, are all that remain to suggest its once honorable estate. Forty to fifty years ago, Evergreen cemetery was quite a resort on Sundays and holidays. The lake view was fine at that point, and the grounds of the cemetery and the college, and surroundings all about were very attractive. 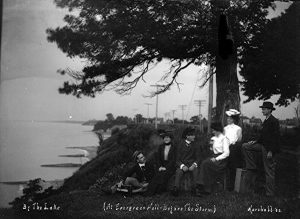 I venture to say that there are hundreds of people in Racine today who visited that spot more or less regularly, who can remember how in those days, after a sever northeaster, coffins might not infrequently be seen protruding from the bank, having been uncovered by the washing away of the earth. It was just as gruesome as it sounds to read it. Although Gilbert Knapp was the founder of Racine, the first settler within the present limits of the city was Joseph (Antoine) Ouilmette, a Frenchman, who came from Grosse Pointe in 1834, and with his Indian wife and children, settled on and made claim to a large tract of land just west of the river, extending from a point a little north of where Kinzie Avenue bridge is now located, south to Cedar Bend. James Kinzie came into possession of much of the land in this section before many years, and his name was later given the avenue which traverses it. James Kinzie built and operated two mills here; one on the east side – a saw mill, and another – a grist mill, on the west side. I remember seeing, when a boy, the ruins of the latter on the bank of the river, and little north of Kinzie Avenue bridge. It is related by old settlers that in the very early days there was a small colony of Mormons which for some months occupied the bottom land west of the river, and just sound of the bridge; now a part of Washington park. In his reminiscences in Wisconsin Historical Collections, John H. Fonda states that when he came to Chicago in 1825, the principal inhabitants were Gordon H. Hubbard and Antoine Ouilmette. He states also that Ouilmette’s wife was a Potawatomie Indian, and that in the treaty of 1863 provision was made for his children, he having died in the interim. It is interesting to note that both of these men figured prominently in the early history of Racine also, Hubbard having been a partner of Gilbert Knapp in promoting the founding of the city. In 1839 Ouilmette was living in Wa[illegible] and Norman Clarke, who had a claim west of the river, went to that town and on September 11 of that year, purchased from him the plot of ground which later became the site of Mound cemetery. The original deed for this land, much the worse for wear, was shown me several years ago by Mrs. J. G. McMynn, daughter of Norman Clarke. She told me that it was her father who first conceived the idea of a cemetery there. Mr. Kinzie became associated with Mr. Clarke in the ownership of the property, and on January 12, 1832, the west 16 acres was deeded to the city by Clarke and Kinzie, for $1,600, subject to mortgage to Ouilmette for $1,200 at 12% interest. The selection of the cemetery site has been no snap-shot affair. As early as November, 1849, a committee of the city council had reported in favor of purchasing a plot of level ground two miles south of the city, and west of the line of the C. & N. W. Rr — about where the old J. I. Case farm is located. The Clarke & Kinzie property was under consideration for nearly two years, and during that time numerous petitions and protests against its purchase were presented and disposed of, and it was not until the matter had been thoroughly canvassed in all of its aspect that the decision to buy it was reached. The opposition had the effect, however, of reducing the amount of land secured to less than half of the original proposal, which was 33 to 35 acres. Dr. P. R. Hoy led the forces that favored its purchase. Two months before the deal was consummated the city surveyor was directed to make a survey and plat of the cemetery. This plat was unsatisfactory to many people, and on the city’s securing possession, and appropriating $500 for improvements, a committee of citizens, composed of Dr. P. R. Hoy, Z. M. Humphrey, Dr. S. W. Wilson, Dr. Elias Smith, Rev. A. C. Barry and John Dickson, drew up and submitted a plan as a substitute to that of the surveyor, and it was adopted by the council. Dr. Hoy was made chairman of the cemetery committee, and it was due mainly to his foresight, good taste and good sense that the Indian mounds have been preserved, and that our cemetery was and is in many respects a model burial ground. In accordance with the Hoy plan, the cemetery was divided into eight blocks, with 1768 lots; the price of the lots was fixed at $5.00 each for residents, and $7.00 for non-residents, the right of choice being given to the highest bidders, and the proceeds of the sale to be devoted to payment for the land. The cemetery was dedicated, with appropriate ceremonies, on June 3, 1852. On Nov. 1, 1852, a resolution was adopted by the council forbidding any more burials in the city limits, and directing removal of all bodies already there. A time limit was set for this task, and it was ordered that when that limit was reached, any remaining should be removed by the city at a cost of $2.50 for adults, and $1.50 for children. This time was extended twice, and finally on March 20, 1854, the sexton was ordered to remove forthwith all that remained. In 1855, the Third ward – now Winslow school – was built on the old cemetery grounds on College avenue, and there are many people living today who were pupils there in 1856 and later, who will never forget the fact that coffins and skeletons were quite frequently unearthed in the block, when excavations were made there for buildings, or other purposes; evidence that the work of removal was not completed as contemplated and ordered. Mound cemetery is a burial ground of exceptional beauty and attractiveness. When purchased by the city in 1852, it had a natural endowment in trees and shrubbery that was the foundation of the wealth of verdure that gives it the charm it possesses today. It was laid out originally with good taste and foresight; the first committee, headed by Dr. Philo R. Hoy, began immediately to set out trees, many of them evergreens, which were placed around the Indian mounds to insure their protection. These arbor vitae, set out nearly seventy years ago, are now almost all dead, and should be replaced by other similar trees. Alanthus, Tree of Heaven; Apple, flowering; Aralia, Ash, Ash, American Mountain; Ash, Weeping; Beech, Birch, City leaf; Birch, European White; Box Elder, Butternut, Catalpa, Catalpa Buntia, Chestnut, Chocke Cherry, Crab Apple, Crab, Flowering; Elm, Elm, Camperdown Weeping. Evergreens — Arbor Vitae, Cedar; ARbor Vitae, Globe, Arbor Vitae, Pyramidal; Cedar, Virginia; Fir, Balsam; Larch, Eurpean; Pine, Dwarf Mountain; Pine, Norway; Hackberry, Hickery, Locust, Linden, European; Maple, Maple, Norway; Maple, Red Leaf; Maple, Soft; Magnolia, Southern; Maple, Sugar; Mulberry, Mulberry, Tees Weeping; Oak, Burr; Oak, Pin; Oak, Red; Oak, White; Plum, Purple Leaf; Walnut, Willow, Wisconsin Weeping. Barberry, Japanese; Coral Berry, Cranberry, High Bush; Currant, Flowering; Filbert, Forythia, Honeysuckle, Red; Honsuckle, Pink; Hydrangea, Everblooming; Hydrangea, Tree-form; Lilac, White; Lilac, Purple; Lilac, Persian; Prickly Ash, Privit, Hardy; Rose, Rugosa; Rose, Prairies; Snowball, Spirea, Spirea Opopolia, Sumac, Fern Leaf; Sumac, Smooth Bark; Syringo; Waxberry, Wayfaring Bush. Canoe Birch, Black Cherry, Bird Cherry, Slippery Elm, American Hawthorn, Ironwood, Pignut, Wild Thorn, Wahoo, Glancus Willow, Hoary Willow. Bittersweet, Frost, Grape, Yellow Honeysuckle, Small Flowering Honeysuckle, Moon Seed, Poison Ivy, Virginia Creeper. Arrow Wood, Quaking Aspen, Blackberry, Hi Cranberry, Black Current, Alternate leaved Dogwood, Yellow twigged Dogwood, Sweet Elder, Prickly Gooseberry, Hazel Nut, June Berry, Lead Plant, Black Raspberry, Wild Rose, Sheepberry, Witch Hazel. The first structure in the cemetery was a tool shed put up in 1855, which cost $25. In 1856, a somewhat larger building was put up, for $130, answering the needs until 1876, when the present chapel was erect at a cost of $1,165. During the same year a wooden bridge was built over Sylvan Dell (the ravine) costing $820, which was replace in 1888 by the present steel structure, the total cost of which was $3,096.31. For many years the only place for receiving a corpse not ready for burial was in a room called the morgue, partitioned off for that purpose in the chapel. In the early nineties [ed. 1890s] agitation for something adequate in this line was begun, and in 1894 the present commodious receiving vault was erected at a cost of $3,375. Some one has said that a fence is, at best, a necessary nuisance, and there is some truth in the statement. When Mound cemetery was new, it was surround with a heavy picket fence, seven feet high; just why was not clear to some people, who said that “nobody outside wanted to get in, and certainly those inside could not get out.” Each succeeding fence has been reduced in height until the present serviceable, though low and unobtrusive iron fence now on three sides of the ground, was built in 1904-5 at a cost of $3,500 for the north and west side; the ornamental iron gate and fence on the Twelfth street side was the girt of Mary King in 1903. The imposing main entrance to the cemetery at Twelfth street side and West boulevard was put in in 1915 by the cemetery commission, for which and appropriate of $600 was made by the city council, though it was not all used. At the beginning there was a fine spring, with an abundant flow of water, on the south bank of Sylvan Dell, and it is there yet and in constant use. For years it was the sole source of supply for all purposes, but eventually wells were dug and pumps put in, which were in use until 1902, when an artesian well was drilled, and pipes laid to distribute the water from it. It was not until 1910 that the city water was piped into Mound cemetery. It was made a rule from the start that there should be no interments on the south side of the ravine, where the chapel is now. This was due to the insistence of Dr. Hoy, who wished to keep the spring free from possible contamination. Features of much interest to visitors are the tame gray squirrels, to the number of 25 or 30, that make their home there; and the great number and variety of birds to be seen where the vegetation and foliage are most abundant. The National Association of Audubon Societies, in a leaflet sent out several months since, urged that all cemeteries be made bird sanctuaries. With the great and growing interest in birds and bird study in Racine, the idea should find instant favor here. The city cemeteries are in charge of a board of cemetery commissioners, composed at this time of the following: H. F. Mueller, president; H. R. Ticknow, secretary; O. C. Peterson, E. L. Tompach and Charles Gere. Louis F. Mohr is superintendent; 22 men are employed in the summer, and ten in the winter. It is believed that there will be general agreement with the statement that the burial grounds have never had more intelligent supervision and painstaking care than under the present administration. The early records of the cemeteries were badly kept, when kept at all. In numerous instances lots were bought for which deeds were not issued or recorded. In many cases lots were sold and used though never paid for. In those days the sexton was oven the only city official interested, and sometimes he was incompetent or worse. Richard Jones – City Cemetery – April, 1845. J. B. Fairchild – City Cemetery – October, 1846. Owen Roberts – Mound Cemetery – April 1851. Owen Roberts – City Cemetery – April, 1851. Charles Steward – Mound Cemetery – May 2, 1853. Owen Roberts – Mound Cemetery – April, 1854. John Marshall – Mound Cemetery – January, 1858. Owen Roberts – Mound Cemetery – April, 1858. John H. Roberts – Mound Cemetery – April, 1873. J. Decker – Mound Cemetery – April, 1876. Alvin Raymond – Mound Cemetery – April, 1877. Levi H. Yance – Mound Cemetery – Sept. 1877. John DeBorsche – Mound Cemetery – April, 1880. L. H. Yance – Mound Cemetery – April, 1881. Jacob Herzog — Mound Cemetery April, 1884. L. H. Yance — Mound Cemetery – April, 1885. W. F. Billings — Mound Cemetery – April, 1891. E. G. H. Wendt — Mound Cemetery – April, 1893. Samuel Gates — Mound Cemetery – April, 1899. W. F. Billings — Mound Cemetery – Nov. 1900. Andrew Johnson — Mound Cemetery – April, 1901. H. J. Doolin — Mound Cemetery – April, 1905. Louis F. Mohr — Mound Cemetery – April, 1907. Nearly three-fourths of a mile northwest of Mound Cemetery on Osborne boulevard, lies Graceland. It covers 51 acres, purchased Nov. 29, 1910, from Charlotte M. Scribner, for $21,750. In 1912 Hare & Hare, landscape architects, of Kansas City, Mo., were engaged at the cost of $560 to plat the land, laying it out in blocks. I am informed by Father T. B. Myers of St. Mary’s church that the first Catholic church in Racine was organized in 1842, and located on Fifth street, between Wisconsin street and College avenue. It was called St. Luke’s church. The same year the church secured ground for a cemetery in block 37, school section, which is the block in which St. Luke’s hospital is now located — Thirteenth to Fourteenth streets, between Wisconsin Street and College avenue. This burial ground was called St. Luke’s cemetery. There is little information to be had concerning it except that in 1854, the bodies that had been interred there were removed to the new ground north from Mound cemetery, across Kinzie ave.
St. Mary’s Catholic cemetery covers 1[ed. illegible] acres of land, divided into 1,200 lots. The original ground contained six acres, which were purchased of Norman Clarke in Oct. 10, 1853, by Martin Kundig and Ulrich Haas, for $600. Six acres at $100 per acre were added about 1898. There have been more than 4,000 interments in the course of its history and only six sextons, as follows — Philip Zirbes, John Komes, Adam Komes, Frank Koll, John Goebel and Andrew Wassh, the present incumbent. The president of the cemetery company is always the resident priest of St. Mary’s, who at present is Theodore B. Myers, who has ministered to that church for 25 years. The two Irish Catholic churches in the city — St. Patrick’s and St. Rose — are associated under the name of Calvary Cemetery association, in the ownership at Calvary cemetery, which is composed of 17 acres of land adjoining St. Mary’s cemetery on the east. The first six acres were purchased of James Kinzie, Oct. 10, 1853 by Martin Kundig and John Carlin, for $300.00 for St. Ignatius congregation, which was the name of the Catholic church in Racine when the Germans and Irish worshipped together, after the building was moved from Fifth street to Lake avenue.On Sept. 28, 1905, 11 acres adjoining on the north were bought of Jacog Fox, for $3200.00. It is believe that there is sufficient burial room in Calvary for the next 50 to 75 years for it has 1,048 lots in the 50 blocks into which it has been divided. Three thousand interments have been made there up to date. The Calvary Cemetery association was incorporated July 6, 1912, and its officer are: S. G. Messmer, president; John M. Naughtin (deceased) vice president; Henry S. Keefe, secretary. There have been but for sextons in the history of the cemetery — Owen Farrell, James Malloy, James Thompson, and Robert Walton. A Hebrew cemetery has recently been established in Racine by the “Ben Yhuda Anshe Sholam,” a local Hebrew religious corporation. Five acres of land adjoining Graceland cemetery on the south were purchase in 1918, of Halsey Reed, for $5,000, and the ground was dedicated with elaborate ceremonies on Memorial day, 1920. Seven interments have been made there, the first in the fall of 1919. The land has been platted and provision made for 500 lots to accommodate eight graves each, and [ed. illegible] for single graves. No improvements have yet been made except that a neat little chapel, costing $1,100.00 has been erected for the accommodation of funeral parties and for funeral ceremonies, etc. On account of the unfinished condition of the roads leading to the grounds, it is now a little inconvenient of access, but it is expected that this defect will soon be remedied. A. Weisman is president of the association and M. Levin, secretary. East Meadows Cemetery, located in the southwest corner of Pritchard Park at the intersection of Ohio Street and Durand Avenue/Wisconsin Highway 11, is one of two pauper’s cemeteries in Racine County. The other is West Meadows Cemetery in Rochester. This cemetery was a burial place for those who could not afford burial elsewhere, as well those who were unclaimed by their families. It is owned and maintained by the county. There are no markers. In July 1971, about 40 bodies were moved to West Meadows Cemetery from East Meadows Cemetery due to the expansion of Durand Avenue. Racine Jewish Memorial Cemetery was established on five acres of land in 1919. The cemetery is managed by Beth Israel Sinai Congregation, located at 944 Main Street in Racine. It is bordered on the north by Graceland Cemetery and Haven on the south. There are more than 400 burials now. Do you know how many people are buried in East Meadows Cemetery?